St.Kierans Bush - Seir Kieran's N.S. St Kierans bush is situated about one kilometre from Clareen cross on the Clareen to Roscrea road. The bush is easily identified from all the items which have been attached to the bush over many many years. 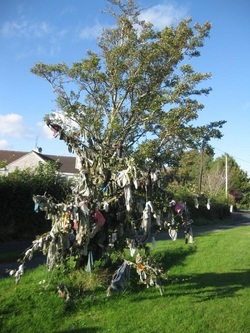 The people of the parish have great attachment to this bush and tie medals, strings, twines, bits of clothing etc on it. The bush here fell in 1884 but a young one was growing at the time and now occupies the site. There is a story told of a gentleman who wanted to remove the bush but his workmen refused to have anything to do with the removal.After sometime they consented on condition that the gentleman himself would strike the first stroke. Accordingly the gentleman did and was stricken with facial paralysis. He died shortly after that. This is the second station on St. Kierans Day and a number of prayers are recited at the bush.Local motorists drive to the left of the bush when travelling from Roscrea to Clareen. This is a local custom.